Washington’s first initiative to the legislature, approved by voters in 1930, gave citizens of each county the right to form a Public Utility District. The Washington State Grange sponsored the PUD initiative because private power companies at that time refused to bring electric service to farms and small communities. The PUD #1 of Whatcom County was formed in 1937 by a vote of the people of Whatcom County. The original desire of the citizens was to take over the Puget Sound Power & Light operations in Whatcom County and replace the investor-owned utility with a publicly-owned electric utility. For a number of reasons this did not happen with the foremost being the start of World War II. By the time the war ended, no one was up to the legal fight that was likely to ensue if the process went forward. 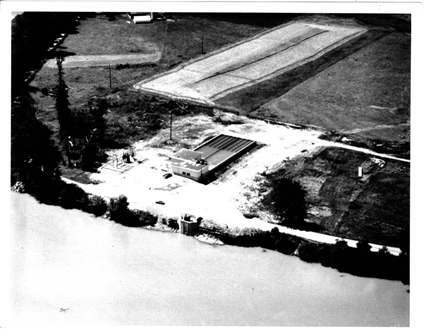 When a petroleum company came to Whatcom County looking for a refinery site in 1952, Puget Sound Power & Light was unable to supply the energy or obtain additional energy in the market at the time. Through an arrangement with other PUDs in Washington State, PUD #1 of Whatcom County was able to obtain the energy which permitted the building of the refinery at Cherry Point. In the process, the PUD gained an electric customer and became a functional utility. The PUD currently has legal authority to supply water and electricity anywhere in Whatcom County with the exception of electricity in Blaine and Sumas because they were existing municipal utilities at the time the PUD was formed. The PUD could have sewer authority, but it would require a vote of the people of Whatcom County. 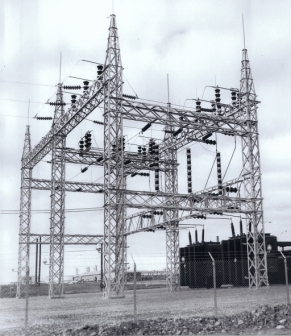 Pictured to the right is the original refinery substation, commissioned in 1954. The PUD went into the water business in the 1960s when an aluminum company was considering building a facility at Cherry Point. Eventually, more industrial facilities were built in the following decade and the PUD supplied even more water service. PUD #1 of Whatcom County is proud of its tradition of supporting requests for action from the citizens of Whatcom County. The PUD has primarily been a supporter of industrial services because that is where the requests have come from. The PUD is actively involved in watershed planning and in maintaining services to its current service area in the industrial zones at Cherry Point and Grandview. The PUD also encourages all our customers to maintain environmental awareness and to practice conservation and re-use. The PUD maintains an active role in fish and wildlife habitat recovery efforts with the Nooksack Salmon Enhancement Association. Pictured to the right is Plant 1 on Ferndale Road, circa 1965.